Finally, 7 years after their birth, Munarheim released their debut full-length album “Nacht und Stürme Werden Licht“, a masterpiece of melodic symphonic folk blackened metal! This German band was formed in 2007 and next year released the demo EP “Märe vom Abgesang der Welt“. In 2009 they self-released the EP “…und der Wind Sang“, which was re-released by Düsterwald Produktionen. The same year, the band’s composer, singer and guitarist Sebastian Braun formed together with David Vardeh (ex-Munarheim member) a new folk black metal project, called Eftwyrd, with whom they released a self-titled EP in 2010. At that time Munarheim was temporarily put on ice, but they soon returned and released a new EP, entitled “Liberté” in 2013, an appetizer for their upcoming full-length album, which was self-released on February 22nd 2014. Since its first steps, the band left a very good impression to me, but it was the “Liberté” EP that made me looking forward for this album, since it was one of the best things I’ve listened in 2013. I was just hoping they could compose a complete album of the same high level. 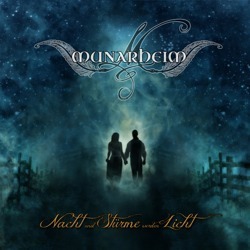 “Nacht und Stürme Werden Licht” is a brilliant debut album, a real masterpiece of melodic symphonic folk extreme metal and for sure one of the best albums of 2014 for me! Munarheim have managed to create a totally personal sound, and no matter if the genres they chose to play are too overcrowded, they don’t remind of anyone else. The base of their music is symphonic orchestral metal, with many folk elements and a wide variety of vocals. What is amazing with this band is its unique orchestrations. They use many acoustic instruments, mostly beautiful classical guitars and flutes, combining them with electric guitars and keyboards in a very clear and “natural” sound, far from the typical synth-based symphonic metal. The majority of their vocals is black metal screams with a “whispering” color and what at first seems somehow in contrast with the melodic nature of their songs, it finally fits perfectly with their music. Of course their compositions are also enriched with beautiful choirs, as well as clean male and female vocals. There are 13 wonderful songs in the album, each one a complete musical entity on its own, with a total duration of 48:30. Their music is really melodic, romantic, emotional, grandiose, lyrical and poetic, a work where classical music, acoustic folk and symphonic black metal are mixed harmonically in a unique balance! Their lyrics are in German, except for the song “The Last Unicorn” in English and they are all included in the CD booklet. There are really not many things I could say more about this album! If you like melodic symphonic metal, you can’t miss this work. Munarheim has released a really qualitative album, very complex and at the same time so easy and enjoyable to listen, something that reveals hard work behind it. It’s obvious the band has done a very professional work, putting a lot of effort and money on it; they have already released 3 official videos for “Liberté“, “Terra Enigma” and “The Last Unicorn“. Like if the music alone wasn’t a great reason to buy this album, “Nacht und Stürme Werden Licht” comes also in great package with amazing artwork. It is self-released by the band in a standard digipak edition with 12-page-booklet, as well as in a A5 hardcover book edition with 48 colored pages including CD & Bluray with many extras, limited to 333 hand-numbered copies! If you are still not convinced, you can visit the band’s official pages for sound samples and info on how to buy it, or watch the official album trailer below.